The story of the Brigidine Sisters in New Zealand began a long time ago, on the other side of the world. Inspiration for their Brigidine calling comes from an Irish Saint, Brigid. Born about the year A.D. 450, she was the daughter of a pagan chieftain Dubthach and his bondwoman Brocessa. Legend relates that she was born on the thresholdof the house, between the two worlds of her Druid father’s nobility and her Christian mother’s slavery. Certainly she played an important role as bridge-builder from the world of pre-Christian faith to that of Christian Celtic spirituality. Brigid’s title, "Mary of the Gael", is attached to her in the most ancient of records. Her father, Dubthach, had arranged her marriage to a man of learning and a philosopher, ranked next to the king in importance. Brigid’s mind was set on giving her life to God. She declined the marriage, kindly but very firmly. St. Patrick’s influence on the young maiden had stirred her interest in the monastic movement. She came to a Ridge overlooking the Liffey plain. There beside an ancient oak tree, she built a small oratory - Cill Dara - "Cell of the Oak," which gave the town of Kildare its name. Word soon spread around about Brigid’s Oratory and many women wished to join her. Previously, those who had consecrated their lives to God had lived at home. Brigid now saw the need for a form of community life for women. One legend relates how, she wanted to establish a Monastery, but had no land. When she approached the King of Leinster, he refused her. She persisted with her request, because all she wanted was enough ground that her cloak would cover. The King could see no harm in this, so he said yes. Brigid chose the site for her Monastery and asked four of her sisters to pick up the corners of her cloak. She instructed them to move to the north, south, east and west until the ground she wanted was covered. That place we now know as the Curragh in Kildare. There she built her Monastery and established religious life for women. This Monastery was later to house both men and women. Hospitality was an essential element of monastic life and in this, Brigid excelled. She taught the dignity of manual work, and was regarded as a prophetess, weaver, earthwoman, shepherdess and traveller. Brigid Giving Father’s Sword to Beggar. Once when a pagan chieftain lay dying in Kildare, a message was sent to Brigid. She responded and spent time with him, her presence calmed his fears and to idle away the hours she picked up rushes off the earthen floor and began to weave a cross. The chieftain asked her what she was doing, she told him the story of Salvation. When his health returned, he was so touched by the love of God for all people, that he became a Christian. The primitive cross of reeds and rushes, is still made on the 1st February, the first day of around the world as "St. Brigid’s Peace Cross" and has been adopted as an appropriate symbol for Spring (the feast of St. Brigid), and venerated in households throughout the year. Today, this cross is the symbol worn by all Brigidine Sisters throughout the world. Other symbols closely associated with Brigidine Sisters are the silver heart, oak tree, acorn and fire. The Druids had a custom of maintaining a fire, this they associated very strongly with their sacred oak groves. In the Church of the Oaks that tradition passed on without interruption into the holy fire of Brigid. This sacred fire was kept alight by her Sisters until A.D. 1220. It burned until Henry V111 suppressed all Monasteries in the Sixteenth century. In 1993, our Congregational Leader, Sister Mary Teresa Cullen, symbolically re-lit the fire in Kildare’s Town Square. Today two Brigidine Sisters at Solas Bhride, in Kildare keep the flame alight. Fearlessly Brigid challenged the values of society in her day, she was diplomatic and a great lover of peace. The date of Brigid’s death is set between 523 and 526. She is one of the patron Saints of Ireland and Patroness of the Brigidine Sisters, she is truly a woman of the twenty-first century as she was of the fifth. Many stories, myths and legends are told of Brigid. To find out more visit the many web-sites attributed to "Brigid" or "Brigid of Ireland," or "Brigid of Kildare," or "Brigid Mary of the Gael." 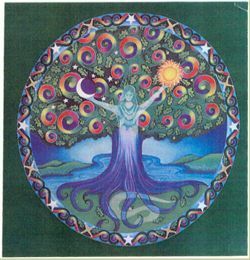 The Oak of Kildare, ancient and enduring symbol, embodies the spirit of Brigid. From the source of Divine Mystery the life-force of the universe pulses through tree, earth and humanity- holding all in sacred relationship.